Guadalupe River Vacation Rental #12496 LakeHouseVacations.com Rent Me! Modern 32 river cabin with the Guadalupe River right in your backyard!! Modern river cabin with the Guadalupe River right in the backyard! This blue beauty is a 1200 sq. ft. home with a deck in the front and covered porch and carport on the side sits on nearly an acre. The home is located between the 2nd and 3rd crossing. Blue Paradise accommodates 12 guests with three bedrooms and two bathrooms. Parking for 4 cars. If interested in popping up a tent in the yard or bringing an air mattress, 2-4 extra guests can be added to the reservation. 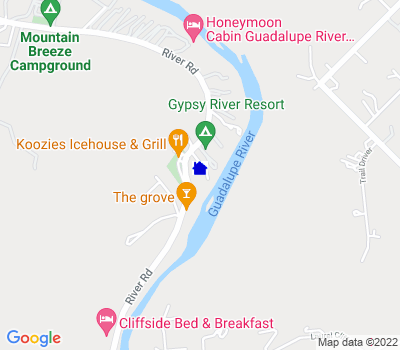 The beautiful Guadalupe River is 130 yards from the backdoor of the home, and there is a gravel road you can drive down 93 yards to alleviate some of the walking! The airy living room is full of light with huge windows looking out onto the new deck and backyard. One of two couches is a queen size sofa sleeper, and there is a large flat screen with cable and Roku. Step up a level from the living room, and the full kitchen greets you with a small island, granite counter tops, and stainless steel appliances. Two tables seat a total of 10, with two more spots at the breakfast bar. The kitchen comes stocked with cookware, dishes, and utensils. The guest bathroom is centrally located to the kitchen as well as the guest bedrooms. The first guest bedroom has two queen memory foam mattresses. The second guest bedroom has two sets of twin bunk beds that also have memory foam mattresses. The master bedroom has a queen bed with memory foam mattress and a flat screen TV with Roku. The master bedroom also has a private en suite bathroom. Both bathrooms come stocked with hotel sized amenities, towels, and two rolls of toilet paper. High quality linens are provided for all beds and bathrooms. There is a washer and dryer in the home for you to use as well. Outside there is space to spread out on the deck or out in the yard. The large yard is perfect for outdoor games, or nighttime relaxation next to the fire pit. This condo comes with one 8 ft. kayak, one 10.5 ft. two person kayak, as well as 2 hammocks (perfect for a midday nap)! There are steps which lead out to the river which is about waist deep. So pull up a chair and enjoy the view! This ad has been viewed 2061 times. It great weekend lot of fun the Canoes was fun to get in the water"
This property was in a great place to stay. We loved the coziness. " A great place for family fun. We really enjoyed the river location, scenery, and the kayaks. The house was clean and well stocked. Nice." This place had everything we needed and more.The private river access was parents said the bed in the master bedroom was more comfortable than the one they have at home.The extra refrigerator and the kayaks where a real bonus during our stay. The family is already talking about staying there again next year "
It was a great place to stay. A couple minor issues that got resolved quickly. Overall, we were very happy with this rental and will be returning later. " We loved the house and the location was excellent. Being right on the river was a lot of fun and Koozies right across the street was a plus! The only downfall was the air in the bedrooms was not working well. We were very hot at night. " What a delight! Everything clean and well stocked. Lots of room inside and out. Kitchen and bathrooms were outstanding. The house is easy to find right on the River Road. Very peaceful and relaxing atmosphere." "Definitely a bit of paradise! A great riverside rental with easy river access, and a large deck to relax and enjoy the great view. The property has been recently refurbished and is in great shape. It's just a short drive to Schlitterbahn water park and other New Braunsfel/Gruene activities and restaurants. I highly recommend this property if you're looking for fun on the Guadalupe!